Almost exactly one year from now I will be putting the finishing touches on our Convention issue. I am writing this on June 12th, and by this date next year, NHS-Con l3 will be history. We all know how the years can fly by, so if you have any thoughts of joining us in Paris next June, now is the time for you to start making your plans. Please consider attending. Our Conventions are a good time for all and this one will be tied in with the largest camera fair in the world. See page 15 for all the latest information. 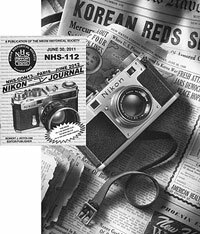 In this, our 112th issue, we have a lead off article by Chris Sap dealing with some of the detailed information he acquired during his visits with the late Tatsuhiko Arakawa concerning the sometimes tortuous route taken by the first Nikons. Dates and serial numbers and production quantities are discussed. Some interesting reading. This is followed by another article from Dr. Manabu Nakai also dealing with the first Nikons and some of the problems that had to be overcome to get it to market. Dr. Nakai has access to material not normally available to researchers here in the West, including detailed translations' of Arakawa's writings. He has some interesting thoughts about the early Nikons. See page 10. On pages 16 & 17 you will see some of the results from the recent Westlicht Auction in Vienna. There were some really superb items in this sale and some surprising hammer prices, both high and low. It looks like there is still a tremendous interest and demand for our favorite marquee. Read the complete Journal by joining the NHS.